Pangong Tso is one of the biggest and most beautiful high altitude lakes in India and hence it is no wonder that it has been featured regularly in Indian as well as International Films, Songs, Commercials etc. 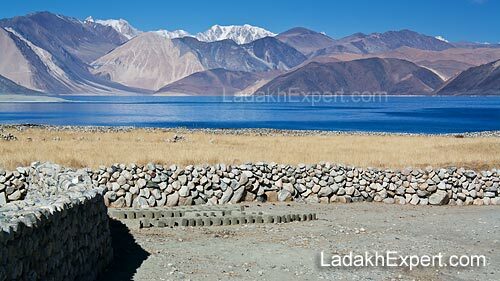 ; in fact Hindi Movie, 3 Idiots’ climax was shot at Pangong Tso (Tso in Ladakhi means Lake). 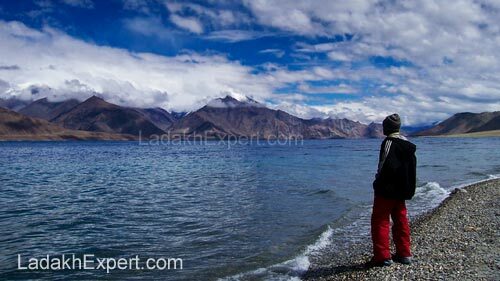 While one third of 135km long Pangong lies in India, two third of it is occupied by the Chinese. Due to this, one needs Inner Line/Protected Area Permit to visit this magnificent lake. In order to reach Pangong Tso from Leh, one need to take the Leh – Manali Highway till the town of Karu (35km from Leh) and from the fork there, take the road going to the left, which will take you to beautiful Shakti Village, from where the ascend to the mighty Chang La pass begins. From Chang La (80km from Leh) one descends all the way to Durbuk Village, where small eateries, guest houses and the sole mobile phone tower exists, making it an ideal pit stop for a cup of coffee and a call back home. From Durbuk, one makes his way to the beautiful town of Tangste (34km before Pangong Tso), where several decent accommodation options exists and it also happens to be at a much lower altitude than the 14,000ft high Pangong Tso, thus making it an ideal night stop for anyone suffering from Acute Mountain Sickness (AMS) or traveling during winter, when accommodation near Pangong Tso isn’t easily available or for that matter, recommended, due to extreme cold. However if you aren’t suffering from AMS, then head straightaway to Pangong Tso and if possible, spend a night near the lake at either Lukung, Spangmik, Man or Merak Villages. All of which offer accommodations for tourists, in the form of Eco Huts at Lukung, Hotel and Home stays at Spangmik and Home Stays in Man and Merak. For those short on time, 155km journey from Leh to Lukung can be done in roughly 5 hours, making it possible to visit Pangong Tso during the day and come back to Leh by night. However, for this to happen, you need to begin your journey early in the morning and you would only be able to spend an hour or two at this magnificent lake. Pangong Tso is accessible throughout the year, even in the dead of winter, when for a month it completely freezes (generally middle to late January) and even cars can be run on it. Access to Pangong Tso is only hampered in case of landslides en route or heavy snowfall at Chang La, which are generally cleared in a day or two. If you have time in hand, please visit Man and Merak Villages, they offer completely different view of the Pangong Lake and will thus help you get photographs, which are vastly different from the ones we normally see. Only BSNL/MTNL Postpaid Connections will work in Durbuk and Tangste, there is no other mobile phone operator present at the moment, so if you are planning to carry mobile phone, make sure it is a BSNL or MTNL postpaid connection. Please do not throw garbage in or around the lake, it is beautiful natural wonder and it is best to leave it litter free for the future generations.